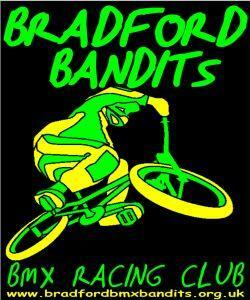 Bradford Bandits BMX Racing Club at Peel Park01274 615150work Cycle RouteWe are one of the biggest and most active BMX clubs in West Yorkshire. Fully accredited to British Cycling, we are based at the BMX track at Peel Park. Our mission is to promote cycling for all ages, concentrating on the Olympic sport of BMX Racing. Whilst many of our senior members travel all around the world to race BMX, we regularly hold local races for both new and experienced riders. We also actively get involved with other cycling projects around Bradford and surrounding areas, and regularly hold practice sessions, race meetings and club rides. October - April, floodlit practice on Tuesday night. Please check website for confirmation of practice times.